One of the many benefits of the sport of fly fishing is meeting and making new friends. In the late 1990’s, while attending the Marlboro, Mass. Fly Fishing Expo, Pam Bates introduced me to Stan Bogdan- the reel maker. I had heard of him before and saw his reels being fished by friends, but never dreamed of meeting him in person. In what seemed like minutes, we became fast friends and we spent many hours and days talking about fishing, especially Atlantic Salmon fishing (Stan’s favorite). So much could be said about him- he was humble, honest, sincere, generous in heaping praises for my rod building skills, etc. We traveled together to many destinations: The Catskill Fly Fishing Center and Museum, The American Museum of Fly Fishing, friend Joe Garman’s home in Connecticut, various fishing clubs and TU chapters, his 90th Birthday Party, Christmas and Thanksgiving, and so many others. On March 27, 2011, we lost our dear friend, Stan, at the age of 92. Many of us thought he’d never go... he spent weeks every year traveling with friends around the world in pursuit of Atlantic Salmon. He managed to land numerous large salmon in the summer of 2010, including some in the heavy currents of the famed Alta River in Norway- even doing so with a few broken ribs he sustained when he fell on the embankment. For those of us who were privileged to call him “friend”, we so miss him. But we also know that he enriched our lives in so many ways. His son, Steve, and daughter-in-law Sandy, promise to continue the Bogdan tradition of making the best hand-crafted fly reels in the world. 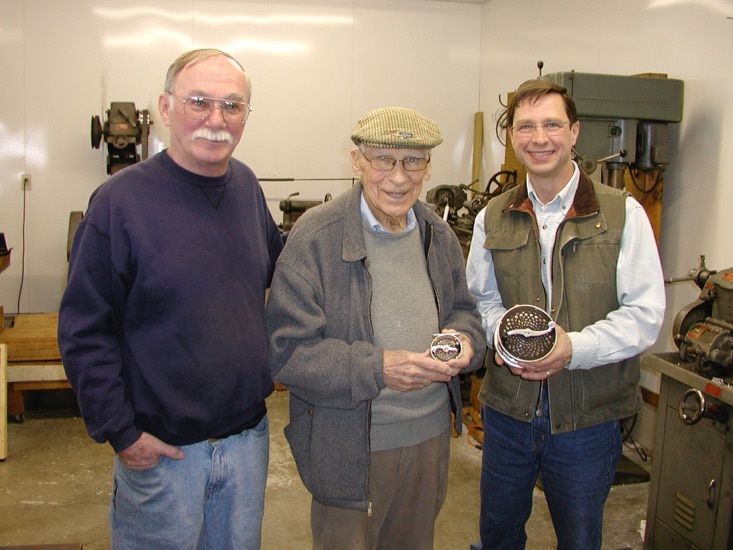 Steve Bogdan, Stan Bogdan, Fred Kretchman in the Bogdan Shop “Holding the smallest and largest Bogdan reels”.